There’s always too much work to do, both at home and at your job. Every morning you get up, get ready, and commute to work. And then it’s time to start coding, to try to make a dent in the ever-growing backlog. Some days you just can’t code fast enough, and it’s taking hours you don’t have to debug that feature you were supposed to finish last week. And to make things worse you’re wasting time in pointless meetings instead of getting work done. Eventually it’s time to leave, and once you’re done with your commute home, you now you need to do chores: cooking, cleaning the kitchen, folding laundry. By the time you’re done you’re too tired to do anything but watch TV for an hour or two and then collapse into bed. And the next morning—you have to do it all over again. Eventually it’s the weekend, and you spend more time on chores, buying groceries, paying bills. You barely have time to breath, relax, and focus on your own interests. But every once in a while, things are better. Every once in a while there’s a holiday, and you have a 3-day weekend. And for once, you have enough time to relax, to get everything you need done and then spend a few hours doing whatever it is you want to do: a hobby, reading a book, writing code for fun. And then it’s back to the daily grind: commute/work/commute/chores, repeat forever until you’re dead. It doesn’t have to be this way. Some programmers don’t have to wait for a holiday to get an extra free day. Some programmers have a 3-day weekend every week. Spending time with their spouse or significant other. Programming a small project of their own, just for fun. Spending time with their children. What would you spend your time on if you had a whole extra day to yourself, every single week? How can you get a 3-day weekend? But how can you find a job with a 3-day weekend? After all, at many software companies you’ll be lucky to get the weekend off. Most employers won’t offer shorter workweeks by default—but by negotiating the right way you can get them to make an exception for you. Negotiation skills will help you set boundaries with your boss, so you’re not forced to work long hours. And negotiation will help you increase your pay, so you’re making enough money even with a shorter workweek. Now, you may never have negotiated before, or negotiating may make you nervous or uncomfortable: that’s normal! Just like you learned how to write software, you can also learn how to negotiate. Take me, for example: while I’ve negotiated a shorter workweek at multiple jobs, when I started out I was a terrible negotiator. In fact, I was so bad I didn’t even try to negotiate. Like many programmers, I started out not knowing how to negotiate. To give just one instance of many: years ago a manager apologetically told me I was underpaid, given my experience and skills. I did nothing, I asked for nothing—and when the next review period came around, I once again did nothing. It never even occurred to me to ask for more money, so I spent years making less money and I should have. Eventually I realized I needed to do better. So I read books, and observed other people; I negotiated higher salaries, and negotiated consulting contracts. And then one day I found myself negotiating a shorter workweek—and it worked! And then I did it again at another job. And then again, at a third job. 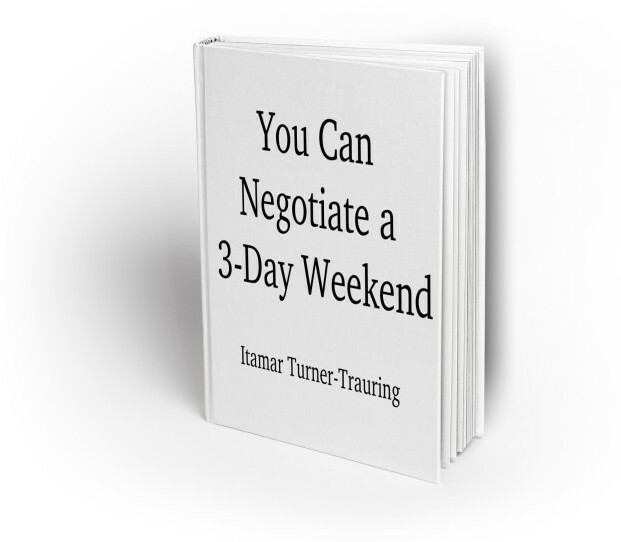 Just like I did, you too could learn how to negotiate a 3-day weekend. But unlike me, you don’t have to figure this all out on your own. Instead, you can benefit from my research, my experience, and the experiences of many other programmers I’ve interviewed who have also negotiated a 3-day weekend. To help you get the free time you need, I’ve written a book: You Can Negotiate a 3-Day Weekend. How to build your negotiating skills incrementally, even if you have no prior experience. The best place to start: at your current job. How to combine your salary and workweek negotiations to maximize your take-home pay. How to strengthen your negotiating position. How to explain your value to your boss—or a new employer. How to make sure companies don’t just reject you out-of-hand. You don’t need negotiation experience to get started: you’ll build your negotiation skills and strength up step by step, starting with small exercises. For the first time ever I negotiated my salary! I also set my boundaries clearly and said upfront I won’t be working overtime. I GOT IT!!! I GOT A 4 DAY WORK WEEK!!! It took Alex a while to get what he wanted—this isn’t always an easy process. But he worked at it, he followed the process, and he didn’t give up, and now he has an extra day off every single week. Ready to get your own personal 3-day weekend, every single week? 100% money back guarantee. Simply email me to get a refund. 100-page book in PDF, Mobi (Kindle), and ePub formats. Future updates to the 1st edition. 45 minute personal consultation by video chat. Negotiation can be pretty nerve-wracking, it’s true. The first time I negotiated a shorter workweek with a new employer I spent the whole conversation with a massive, unhelpful adrenaline rush. But here’s the thing: employment is a negotiated relationship, since you’re trading work for time and money. You don’t get to opt out of negotiating, you just have to choose between being a good negotiator or a bad negotiator. Luckily, a lot of negotiation happens long before that nerve-wracking conversation: from your resume to how you present yourself in a job interview, to making sure your current boss know all the good work you’re doing, to making sure you save money. But still, you will have to have that conversation. You will need to ask for what you want, and it will be scary—and the way you work up to that is by practicing. So the book provides small negotiation exercises you can do on the job that will free up a little time, while still not being as anxiety provoking as the big negotiation you will need to at the end. A 3-day weekend sounds great, until you realize you’ll be paid less. But here’s the thing—if you’re learning how to negotiate, you’ll also be able to negotiate a better salary. What matters in the end is the amount of money you make in absolute terms: 80% of a much higher salary is better than 100% of a lower salary. You’ll notice Katarzyna, quoted above, started out by saying that “for the first time ever I negotiated my salary”. Nonetheless, it’s true that you might make less money than you could have otherwise. But once you’re past the threshold of making enough money, would you rather have more time or more money? Preemptively addressing common concerns your boss will have. Strengthening your bargaining position, by ensuring your boss knows how valuable you are, and by building your financial savings. The fundamental reason why your boss might say “yes” anyway: they’re afraid to lose you. How to make your boss’ fear more real by getting a competing job offer. If you live in the US, health insurance can be a big worry. But there’s good news. Under the Affordable Care Act, employers with >50 employees are required to provide health insurance to all full-time employees (if they don’t, they have to pay additional taxes). “Full-time” is defined as employees working at least 30 hours a week or 130 hours a month. So as long as you’re working for a company with >50 employees, for at least 30 hours a week, you’re not any different than a regular full-time employee; at worst your company may require you pay a bit more employee contribution. More broadly, just like you can negotiate for hours and salary, you can also negotiate to ensure you have health insurance. It’s possible, yes, though in practice it doesn’t seem to happen much. If you’re working 4 days a week, chances are you’re going to be paid a pro-rated 80% of your salary. So if your coworkers ask, you just can tell them that. They might be inspired to emulate you, or they might decide lower take home pay is not for them. Either way it’ll be clear you’ve chosen your own particular tradeoff. The book mostly focuses on a US perspective, though some of the programmers I’ve interviewed work in Canada and Europe. Different countries have different cultures, and not everything in the book will apply everywhere. If you’ve just started your first job ever you’ll have a much harder time than someone more experienced. The more valuable you are as an employee, the easier it’ll be to negotiate. If your goal is to make as much money as you possibly can, this book isn’t for you. Having enough money is important, and so there’s a whole chapter in the book on maximizing your income, but fundamentally my goal is to help you maximize your time. Do you want that extra free day sooner, later, or never? You’re going to need to do some work to get a 3-day weekend, and the earlier you start the better. By reading this book you’ll get expert advice, detailed processes, training exercises, and real-world inspiration to help you negotiate for more free time: focused and actionable. The basics of negotiation: The basic principles of job negotiation, along with real-world stories demonstrating why these principles matter. Building financial strength: Why more savings will make you a better negotiator. Practicing negotiation on the job: Get better at negotiation before you reach the all-important final negotiation. The dimensions of negotiation: Time, Money, Benefits: What do you want? What do you need? From money to health insurance, what you need to decide in advance. The value of being an existing employee: The easiest place to negotiate shorter hours is at your current job. Plus, tips to strengthen your negotiating position. Negotiating as an existing employee: What to say, what to do. What makes you valuable? If you’re going to negotiate at a new job, you need be a valuable worker; this chapter will help you figure out your strengths as a programmer. Finding Jobs and Interviewing: Find the companies where negotiation is most likely to succeed. Then, make sure you interview the right way. Negotiating a new job offer: The process you need to follow to negotiate at a new job, from the initial request to following up on the company’s response. Maximizing your income: Learn how to get more time and more money. Hi! I’m Itamar. I’ve been writing software since 1995 or so. As an employee I’ve worked for companies small and big, ranging from 8-person startups to a year at Google as a product manager (my previous employer got acquired). And as a consultant I’ve written software for a similarly broad range of companies. I wrote this book in the hopes of helping you and other programmers get a shorter workweek, just like I have. Want to learn more about me? I write a weekly newsletter sharing my past programming and career mistakes, and how you can avoid them.